I’ve known I was a writer since I was three. I was one of eight kids, and when you grow up in those great big families, you desperately want something that’s just yours to make you feel special, to separate you from the pack. I grabbed writer. My mother entered me in a contest to name the Fizzies whale, and I won in my age group. It’s quite possible that mine was the only entry in the three-and-under category, since Cutie Fizz was enough to win my family a six-month supply of Fizzies tablets (root beer was the best flavor) and half a dozen white plastic whale-embellished mugs with turquoise removable handles. 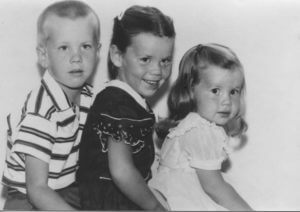 Three out of eight: Claire (middle) with older brother Danny, younger sister Cathy. 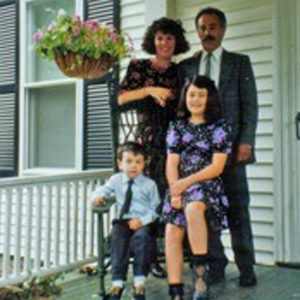 When I was six, my first story was published in the Little People’s Page in the Sunday paper (about Hot Dog, the family dachshund, even though we had a beagle at the time, the first clue that I’d be a novelist and not a journalist) and at sixteen I had my first front-page feature in the local weekly. I also wrote really bad poetry in high school that I thought was so profound—yep, I was that girl. I majored in film and creative writing in college, studying with some big-name writers who gave me lots of positive feedback. I’d been on this writing road for most of my short life, and it seemed like a straight shot to my destination. I fully expected that the day after graduation, I would go into labor and a brilliant novel would emerge, fully formed, like giving birth. It didn’t happen. Instead, I choked. I panicked. I guess I’d learned how to write, but I didn’t know what to write. I felt like an imposter. So, despite all expectations, especially mine, I didn’t write much of anything over the next couple decades. Even the prospect of writing a thank-you note would throw me into full-blown anxiety mode. Hindsight 20/20, I can see that I just hadn’t found my stories yet. I write about real women—their quirky lives, their crazy families and friendships and relationships, what they want and what’s keeping them from getting it. I simply needed to live more of my own life before I could accumulate enough experience to write my books. If I could give my younger self some really good advice, it would be not to beat myself up for the next twenty years. But I did. Most of the time I felt a low-grade kind of angst about not living up to my potential. I did my best to ignore it, but sometimes it would bubble up and I’d feel gut wrenchingly awful. I tried my hardest to bury the feelings, to forget about my dream. But it never went away. Writing a novel remained the thing I wanted to do more than anything else in the whole wide world, as well as the thing I was most afraid of. So, I did some other creative things. I wrote shoe ads for an in-house advertising department for five weeks right out of college, became continuity director of a local radio station for a year or two, taught aerobics and did some choreography, worked as a bartender, helped a friend with landscape design, wrote a few freelance magazine pieces, took some more detours. Claire with husband Jake, and children Kaden and Garet. Eventually, I had two children and followed them to their artsy little school as a teacher. I meant to stay for a year or two, but somehow, I stayed for sixteen. Sixteen years. I taught everything from multicultural games and dance to open ocean rowing to creative writing. I loved the kids and even won the Massachusetts Governor’s Fitness Award for innovative programming. But all along I was hiding from my true passion, the thing I was born to do. And then one day, propelled by the fierce, unrelenting energy of midlife, the dream burst to the surface again. I was in my forties, sitting with a group of swim moms (and a few good dads) at 5:30 A.M. My daughter was swimming back and forth and back and forth on the other side of a huge glass window during the first of two daily practices that bracketed her school day and my workday as a teacher. The parental conversation in the wee hours of that morning, as we sat bleary-eyed, cradling our Styrofoam cups of coffee and watching our kids, was all about training and form and speed, who was coming on at the perfect time, who was in danger of peaking before championships, even who just might have a shot at Olympic trial times. In my mind, I stepped back and listened. Whoa, I thought, we really need to get a life. And right at that moment it hit me with the force of a poolside tidal wave that I was the one who needed to get a life. A new one, the one I’d meant to have all along. I was not getting any younger, and I was in serious danger of living out my days without ever once going for it. Without even trying to achieve my lifelong dream of writing a novel. Suddenly, not writing a book became more painful than pushing past all that fear and procrastination and actually writing it. So, for the next six months, through one long cold New England winter and into the spring, I wrote a draft of my first novel, sitting in my minivan outside my daughter’s swim practice. It sold to the first publisher who asked to read it. Lots of terrific books by talented authors take a long time to sell, so maybe I got lucky. I’ve also considered that perhaps if you procrastinate as long as I did, you get to skip some of the awful stages on the path to wherever it is you’re going and just cut to the chase. But another way to look at it is that there were only three things standing in my way all those years: me, myself and I. My first novel was published when I was 45. At 50, I walked the red carpet at the Hollywood premiere of the movie adaptation of my second novel, Must Love Dogs, starring Diane Lane and John Cusack, which I’ve since turned into a 6-book series. I’m currently in negotiations for a television series based on the Must Love Dogs book series. I’m now the New York Times bestselling author of 18 books. The overarching theme of them all is reinvention for 40-to-forever women. I’ve also taught reinvention workshops and spoken about reinvention at conferences all over the world. Not many days go by that I don’t take a deep breath and remind myself that this is the career I almost didn’t have. I think we all have that sweet spot—the place where the life we want to live, and our ability intersect. For some, the trick is finding it. If you’re one of those people, you’re still trying to figure out what you want to be when you grow up—at 30, at 50, at 70. My advice is to keep trying things until you find that click. For others, like me, deep down inside you already know what you want, so it’s about finding the courage to dig up that dream and dust it off. It’s not too late. Dreams don’t have an expiration date. Not even a best by date. If it’s still your dream, it’s still your dream. Rise above the negativity. Whatever the motive, lots of people will tell you why you can’t or shouldn’t do whatever it is you want to do. You just have to decide to do it anyway. You might want to protect yourself a bit in the beginning, too. I didn’t tell anyone about my first book until it was finished. You don’t need anyone’s permission—just do it! Be who you really are. The big buzz word these days is branding, but I think of it as authenticity. This is the first job I’ve ever had where I wasn’t pretending, or at least trying to pretend, to be a slightly different person. Who I am and what I write are totally in synch. There’s tremendous power in that! Confound expectations. If everybody’s doing it, it’s already been done. Put a little surprise in everything you do. Originality counts! Do something nice for someone. It’s easy to get needy when you’re struggling to figure out what’s next, but many of the great things that have happened to me were triggered by something nice I did for someone else. People talk—your actions determine what they say. As one of my characters once said, karma is a boomerang! Get your tech together. Everything you need to know about the world you want to conquer can be found online. Get your computer skills up to speed – fast! Take a class or find a computer mentor. Research. Network. Create an online presence. The Internet is a great equalizer – and there are so many opportunities out there just waiting for you to take advantage of them! It’s Never Too Late to Shine On! 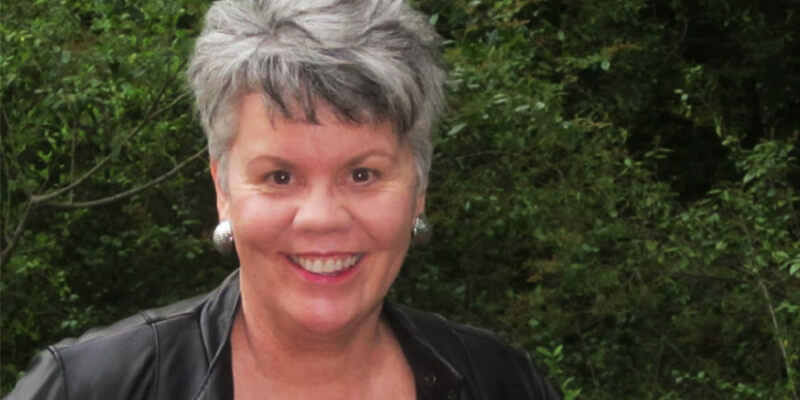 CLAIRE COOK wrote her first book in her minivan at 45. At 50, she walked the red carpet at the Hollywood premiere of Must Love Dogs, starring Diane Lane and John Cusack, which is now a 6-book series. 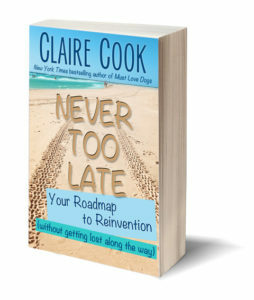 Claire is the New York Times, USA Today and #1 Amazon bestseller of 18 books, including Never Too Late: Your Roadmap to Reinvention and Shine On: How To Grow Awesome Instead of Old.Stay in the loop for new releases, giveaways, and insider extras at ClaireCook.com/newsletter. Claire’s story and her book Never to Late are why I am getting ready to shop my first manuscript at age 56. Don’t give up. It CAN happen. Wow what an inspiring story about following and executing your dream. 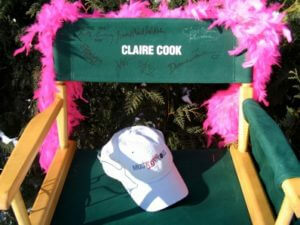 I hope we can all follow our dreams, because the only one standing in our way, Claire says is me, myself, and I.